In 1972, Frank limped out of the war in Vietnam and back into the world, a world outwardly familiar but increasingly foreign to him. In his small Mnnesota hometown, the returned soldier is unable to negotiate the uneasy distance that now separates him from his family--his highway patrolman brother and a sister-in-law with her own uneasy future. His once-mundane world of football, cars, and Sunday dinners turned suddenly strange and threatening, Frank is caught between the realities of war and the absurdities of peace. Estranged from all that was familiar, he stares down the iconic celebration of returning local heroes – the high school homecoming game. "FOUR STARS. 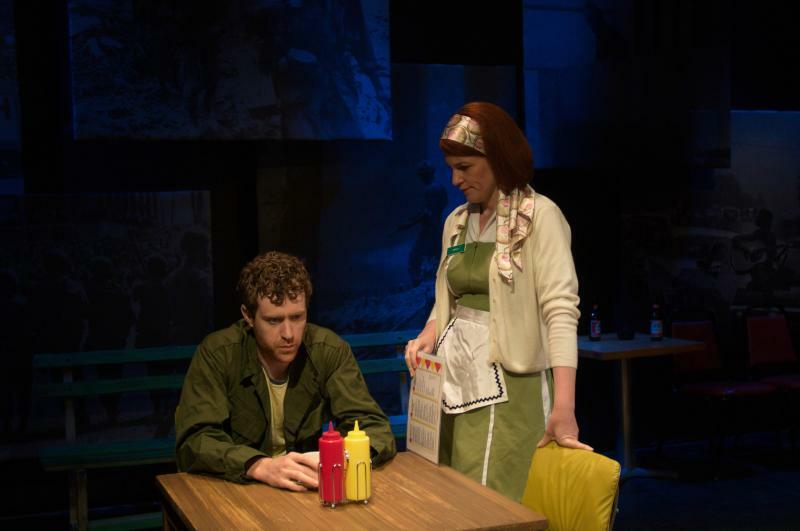 Against (a) backdrop of blown-up and silkscreened photos representing the nation's collective mood in the fall of 1972, Robert Koon's new play movingly depicts the same unrest in the microcosm of a small town in upstate Minnesota." "...richly detailed...Koon's notable skills in character development forge a series of vignettes that feel consistently real...there's an authenticity in the writing..."
"Beautiful acting and a strong sense of time and place..."
"Playwright Robert Koon is certainly onto something important in his play, HOMECOMING 1972." "A show that should not be missed."